Updates to Barbara Gene's profile since your last visit are highlighted in yellow. Two daughters: Michele McQuarrie Roberts (born 1968; East High School graduate in 1986, living in Lewisville, More…TX) and Sara Denise McQuarrie (adopted 1980, living in Garland, TX); two granddaughters: Kate Michele Roberts and Shanelle Roberts, graduates of Lewisville High School in Lewisville, TX. One fiesty cat named Precious Meep. My husband died in 2008. He was from Sunset, UT. I got married in 1967 after working for several years. I worked at the State Hospital in Provo as a secretary for three years. After our wedding we moved to Madison, WI where my husband was a graduate student at the University of Wisconsin, and received his MA in French and Theater. I worked for the corporate office of Oscar Mayer and Company until I had to quit because of pregnancy complications. After Michele was born I worked for a printing firm (which was owned by one of my co-workers at Oscar Mayer) part time for a year or so and then worked for the Madison Institute of Religion. I also typed manuscripts and dissertations for faculty and students in the Department of French and Italian at the University of Wisconsin. Many of the dissertations were in French. We moved back to SLC in 1977 where my husband worked and received a masters degree in Human Resource Economics from the University of Utah. When we adopted Sara in 1980, I had 24/7 experience helping her overcome the disabling factors of Autism. I worked for the Department of Surgery at the University of Utah from the time we moved back to SLC until we moved to Dallas, TX for my husband's job in 1989 and found that Dallas had the best school in the country, at that time, for children with autism. He planned to complete his PhD in French but his life was cut short by pancreatic cancer (2008). Robert spoke fluent French and had to show his passport in France to prove that he was an American. I had to learn French to speak with our daughter, Michele, because she spoke French before she spoke English. Now that I don't have much opportunity to be around people who speak French, I am losing much of what I knew. I tried to learn Spanish (so I could speak with my neighbors), but that only confused me more. In 2001 we took a trip to Scotland and spent about a week on the Isle of Mull. Over the years I have worked for several psychiatrists in the Dallas area. I probably need to go to work but I have my hands full trying to keep up my home, go to school, and work one morning a week at the Dallas Texas Temple (Church of Jesus Christ of Latter-day Saints). I was not planning to attend the reunion but my daughter Sara wanted to go to SLC to see her grandmother so we are both coming to the reunion. (I attended part of the Uintah High School (Vernal, UT) 50th year reunion on June 26. It was great seeing "old" friends.) I am sure the South High 50th year reunion will also be great! I am making great progress in obtaining my degree as a psychiatric assistant I have only two semesters left at Brookhaven Community College (I take only 6 hrs per semester (free). I will probably finish up at the University of Phoenix here in the area. I had to have my Suzy dog put down in July. I miss her a lot. Meep, the cat, is now top dog! Mom is still living with me so essentially I am on call 24/7. My youngest granddaughter graduated from high school in June after I graduated in May. It was really special to have my mom, my two daughters, and my two granddaughters at graduation. I still love living in Texas (Dallas)! I hope our next reunion with be at South High!!! Check my entry under school story. This fall I plan to take a sculpture class along with a welding class so I can complete my sculpture. Mom is now 91 and thinks she is too old. She requires much more supervision and help now. School is my outlet along with my service in the Dallas Texas Temple. I began I new chapter in my life on March 7 when my mother passed away, 20 days short of her 92 birthday. She was buried in Salt Lake City, next to my father. I visited briefly with Lois Shaffer at mom's memorial service and with Chari Engles the next day. We are all looking forward to the reunion in August. I hope to take the sculpture class and welding class either this fall or in the spring. Going to school for fun is really fun. I earned my PHT degree (putting hubby through) in Wisconsin and Utah. Now it is my turn to get my degree. It took me a long time to gather my transcripts but now I am attending school and have promised my granddaughter that I will get my degree before she gets hers. I plan to be a psychiatric assistant. Life at South High school was hard for me socially, although the classes were great. I just didn't feel like I was "in" with the group. I think I have attended one class reunion. I have preferred to go to Vernal, Utah, and attend class reunions with the kids with whom I grew up. Their 50th Reunion will be the end of June 2010. An interesting meeting took place a few years ago when my husband introduced me to one of his greenie companions in France--none other than Gordon Jones (whom I met my first day at South High in a German class) from our graduating class! It's a small, small world!!! While going through some of my father's papers, I found the program for his graduation from South High when the school was "new." I'll bring that with me to the reunion. My mother moved in with me last August which slowed my progress toward my degree. However, I just received my grade for the summer school class I just completed. I have succeeded in keeping up my "A" average since returning to school. I am on track to receive my Associate degree next May. Well, it is official. I will graduate with my Associate of Arts in General Studies from Brookhaven Community College on May 16, 2013. However, I will not be certified as a psychiatric assistant. Actually my certification is on hold. My youngest granddaughter will graduate from high school in June 2013. I am set to graduate from Brookhaven College on May 16, 2013, with an Associate in Arts. I'm probably the last person from the Class of 1960 to get my degree but "The harder the challenge, the greater the victory." My husband and I adopted Sara in 1980. She is autistic and lives in a group home about 16 miles from me. I put my husband through two Masters degrees and almost a PhD before he passed away in 2008. Currently I am going to school and taking care of my 90 year old mother who is recovering from pneumonia and working in the Dallas Texas Temple one morning a week. After graduation, I am going to sleep and then decide what I will do next. Graduation is now over!!! I ended up graduating with honors, having passed all my classes at Brookhaven College with 4.0. Maybe I will try my luck at finishing a bachelor's degree. I have decided not to go for my BA. May 29, 2014 - My granddaughter, Shanelle, and I just finished a class in 3-D design. We had to create in wire, wood, metal, and a project in 3-D printing. I never thought of myself as an artist in these mediums. What an experience!!! In addition, Shanelle has decided college is okay and will be taking at least one class per semester until she finishes her degree (right now that is in genetics). Barbara Gene Litster McQuarrie has left an In Memory comment for Profile. Barbara Gene Litster McQuarrie has a birthday today. Barbara Gene Litster McQuarrie posted a message. New comment added. I was shocked to hear of Nelson Patton's passing. My sincere best wishes to all of his family and all the Cubs who knew him. I met Nelson when my family moved to SLC when we were all sophomores. I believe he attended the Friday evening event of out 55th Reunion where I had the opportunity of speaking with him. I am thankful I was able to do that. I'll take this opportunity to wish all of us a HAPPY BIRTHDAY in celebration of our making it through 3/4 of a century. I am still going to school at Brookhaven College in Dallas. I was in Vernon, Alabama, in August delivering a requested sculpture for their museum. I am in the process of making two more sculptures: one on sandstone and iron rock and one on Alaskan granite. I am looking forward to the reunion in 2020. GO CUBS!!! Bethany Anderson Stewart posted a message on Barbara Gene Litster's Profile. I need to check on our website more! Just see where you just celebrated a birthday. I hope it was a great day! Thanks again for all your help at our last reunion. Before we know it, it will be time for another one !!! Barbara Gene Litster McQuarrie posted a message. David, I have been thinking about you and wondering where you were. We had a great class reunion last summer. Lois (Freestone) Shaffer was not able to come but my daughter, Sara, and I drove up to Utah from Texas. We had a great trip. We brought my sister Sue Ann back with us and then took her with us to Nauvoo, Illinois, and on up to Wisconsin to see her granddaughter and Sara's biological mother and sister. This week I am finishing up a copper sculpture of the Tree of Life at Brookhaven Community College. I certainly do not think of myself as an artist but maybe someday that will change. I have had a roommate for the past 9 months or so. She lived in Phoenix and was transferred to Dallas by American Airlines. She moved into her house a week or so ago. Again, it's good to know you are still around. 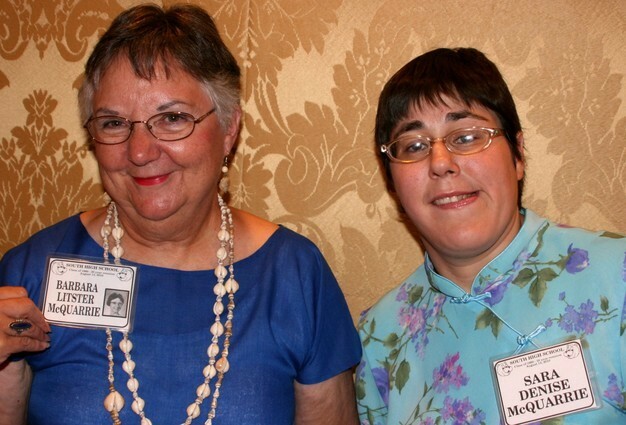 Barbara Gene Litster McQuarrie updated profile. View. Barbara and Sara (with her head down, which is her usual stance when walking) at the 50th Reunion picnic. We both enjoyed the event very much.